Click on the links below to download the rules PDF file and other supplementary materials. 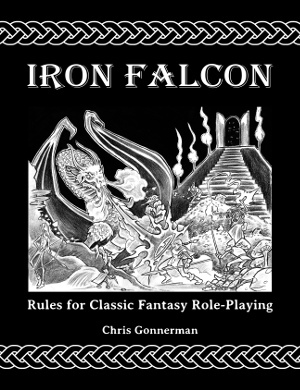 Iron Falcon Rules for Classic Fantasy Role-Playing is available in print in paperback from Amazon.com and CreateSpace.com as well as in both paperback and hardback from Lulu.com and RPGNow.com. Iron Falcon Adventures One is available in print in paperback from Amazon.com, CreateSpace.com and Lulu.com. You can find discussions of this game in a special reserved section of the Basic Fantasy RPG forum; just click here to visit the Iron Falcon forum. If you prefer social media, look up the Iron Falcon pages on Facebook and Google+! The original development threads for Iron Falcon can be found in three places: on the Iron Falcon subforum here, on the Dragonsfoot.org Forums, and on the ODD74 Forums. I now have a news page for anyone wanting to see the changes, and an RSS feed if you'd prefer to be notified about them. Release announcements are published in the original development thread on the forum.